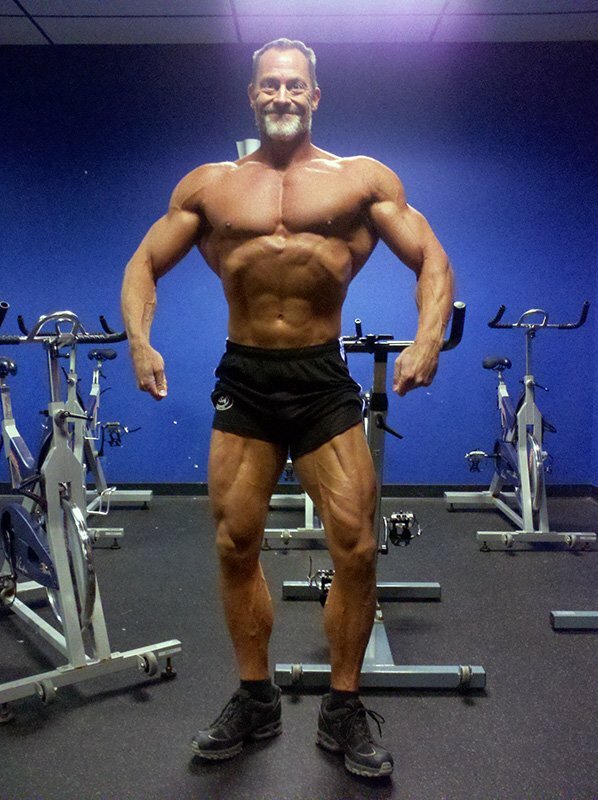 According to bodybuilding standards, Ken's best years are behind him. But he's on a mission to defy the odds at age 48. See how this competitor keeps winning! I remember seeing Arnold on the cover of Muscle and Fitness when he came back and won the 1980 Olympia like it was yesterday. At that moment, I said "I want to look like that!" and my journey started. At age 15, I purchased a bench with weights and started training in my bedroom with Arnold's The New Encyclopedia of Modern Bodybuilding. It wasn't long before I outgrew my home gym and joined the local YMCA with more equipment. The YMCA provided a better atmosphere with more encouragement. Old school lifters took me under their wing and inspired me to train heavy. At age 16, a bodybuilding gym opened in Bismarck, North Dakota. The owner was a bodybuilder who competed in Mr. America. My training partner and I started training there at 5 a.m. before school. The gym wasn't open that early, but we had the keys. There was no way to heat the gym on days when North Dakotan winters dropped the temperature well below zero. It was freezing, but it made it more exciting for us. We followed Mike Mentzer's high-intensity training, so our workouts were short and intense with lots of supersets and forced reps. I competed for the first time during the summer between my junior and senior year and took fourth place in the teenage Mr. North Dakota. I looked like a huge set of traps with sticks hanging from them. I still have the traps, but thankfully my arms have improved. I kept competing until the 1990 Mr. Western Washington (the same year I got married). I took second place in the show and was disappointed, but I needed to make changes in my life. Bodybuilding was consuming, so I gave it up and didn't touch a weight for 10 years. In 2000, my life was in line and my priorities were correct, so I started lifting again. I started at home until I felt ready to join a gym. I had no intention to compete again, but it came back fast (muscle memory is for real). Within six months, I benched 335 pounds for five reps in my basement with my wife as a spotter. The year after, I decided to compete again, entered the Vancouver Natural Classic, and won the heavyweight class at age 38. I was back with a much healthier outlook. I've competed many times in past 10 years at Musclemania and NPC shows in the Northwest. I believe the keys to my success as an over-40 athlete are training heavy and staying in good shape year-round. In my 30s, I could lose 30-35 pounds to get in shape for a show. Now I stay within 15-20 pounds year-round so I don't sacrifice muscle to get lean. I still train with intensity. My motto is: you can train long or you can train hard, but you cannot train hard and long. I train fast paced with 1-2 minutes rest between sets. I stick with basic exercises and do 2-3 exercises per body part with 2-3 working sets. Working sets are at or close to failure. Typically, my rep-range is 7-10. I would like it to be 6-8, but age makes me cautious about injury (higher reps for shoulders and legs are more effective). I use a split that prioritizes my weaker body parts, which are legs and shoulders. Everything in my meal plan revolves around carb control. I eat the same year-round. My eating plan is low-carb with two high-carb days per week. My typical day consists of less than 40 grams of carbs, and often below 30 grams. I love competing, but the stage isn't my favorite part; it's the preparation. I love seeing how far I can push my body. I love discipline. I'm a creature of habit and my life is regimented. My lifestyle makes decisions for me. When I go to restaurants, my food choices are already decided. Even though I'm 48 years old, I refuse to believe I can't improve. I'm not going to get bigger, but I believe I can improve my weak areas and bring a legit package to the stage. Nature is undefeated when it comes to age, but I'm trying to put off that victory for as long as I can. Arnold was a huge motivation to me in the beginning. Now I'm motivated by athletes in any sport who compete at a high level, especially people who defy age. Guys like Dave Goodin (The Texas Shredder) are motivational because they still tear it up. At this point in my career, motivating others is a huge motivation. A major part of what I do is to inspire others. I look to my goals for inspiration. I don't do anything based on feeling. Whether I "feel" like it or not, I do what my goals require. I'm a road cyclist, which is my main cardio. I love watching big bike races like the Tour de France. Those athletes are extremely inspiring because they exert superhuman effort and then get up and do it again the next morning. I won the overall at the 2012 Washington State Ironman. It's the biggest natural bodybuilding show in the northwest and was the culmination of a nine-year journey. I want to step up to a national-level show in the next two years. For an over-40 athlete, I believe the most important tip is staying in decent shape (under 12 percent body fat) and doing cardio year-round. As the body ages, it loses efficiency, so staying close to competition shape is vital. I'm still partial to the king—Arnold. Bodybuilding.com has been huge in my journey. Having a source for affordable supplements makes supplementing available to anyone. After my comeback, there was so much new information available. Bodybuilding.com was a tremendous resource for new knowledge. The articles have been invaluable and made a huge contribution to my success. Thank you.